First up, some good news! We finally got some cash out of our insurance company and it’s fair to say that it was incredibly useful to have your survey to hand during the loss adjuster’s (second) visit. Thanks so much again for your assistance with this’. The client called us up some time ago asking our advice. 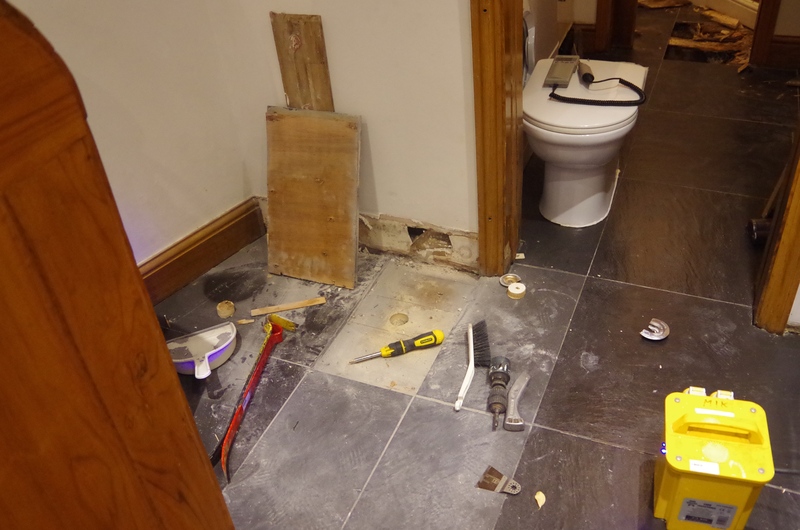 There had been a leak in the buildings services which had led to some decay in a downstairs toilet floor. The client had called the insurance company, who sent out a loss adjuster.However,the client was unsure of their recommendations. The insurance company said the entire floor from the toilet through the utility room to the kitchen needed to come up for inspection; this included removing the kitchen. Can imagine how disruptive this would have been? I advised the client to find out if the insurance company would cover the reinstatement costs? – The answer was it depends on certain conditions! So can you imagine having your floors and kitchen stripped out only to find that there is a clause in the insurance policy that doesn’t cover re-instatement costs? The insurance company then said that they wasn’t going to cover any repair work as their loss adjuster said the damage was caused by ‘rising damp’. Having never seen a single case of genuine rising damp, I suggested that we come and carry out an invasive survey and prove beyond all reasonable doubt that it was the leaking pipes that caused the damage, not ‘rising damp’ (of course) ! 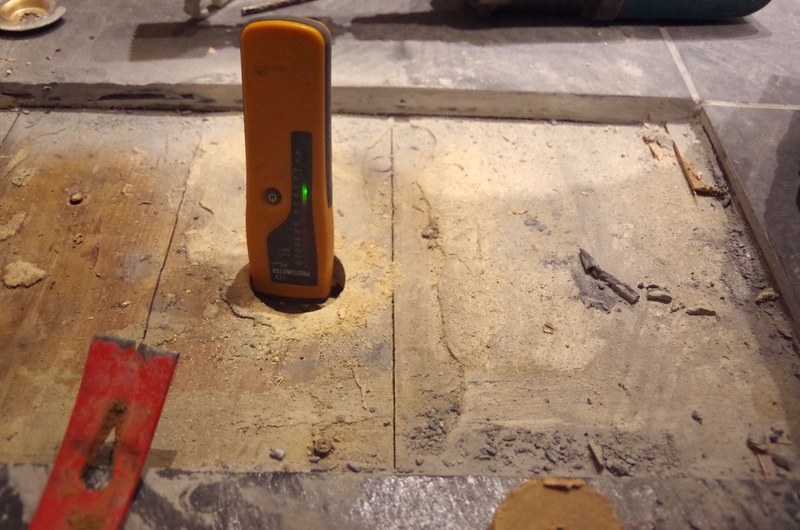 As part of the survey, a floor tile in the kitchen area was carefully removed and a hole was cut in the plywood floor sub-base and floor boards, this enabled us to see what condition the structural subfloor timbers were in. After checking the area out the timbers were found to be dry and sound; there was no need to strip the kitchen and the floor out after all. The floor tile was re-laid; you would never have known that it had been up. The insurance company then sent out their loss adjuster, he was presented with our report; he couldn’t disagree with its findings. He then wrote out a cheque for £5,000. We did another survey in a similar situation, the insurance company paid out £10,000. If you are having trouble with your insurance company and they are not paying out because of a ‘rising damp’ clause in their policy- call us and we will find the cause of the damp and we are sure it won’t be of the ‘rising’ type ! We have another client who contacted us about the trouble they were having over a broken roof tile. Their insurance company had decanted him and his wife into a hotel while they argued the toss over liabilities! We reviewed the case; their loss adjuster was unqualified and engaged an equally unqualified builder to give an opinion on the cause of the broken roof tile. Their opinion was that the broken roof tile was down to ‘wear and tear’. After reviewing all the information available, it was not possible that ‘wear and tear’ was the cause. So the insurance company argued the toss – like they like to. We told the client to get a roofer to replace the tile so that he and his wife could move out of the hotel and back to the comfort of their home and to stop unnecessary rain water ingress !!! We could then counter the insurance company’s claims. A roofer was engaged and charged £125 to replace the tile. Why the insurance company didn’t instruct this in the first place, we do not know. They were happy to pay out for an unqualified opinion and a hotel for the client and his wife, for quite some time but not for a sensible repair! The moral of these tales; get an RICS qualified (and sensible) surveyor involved from the start. And as with most cases our fee’s are recoverable from the insurance company, so there is a win-win situation with a sensible outcome.